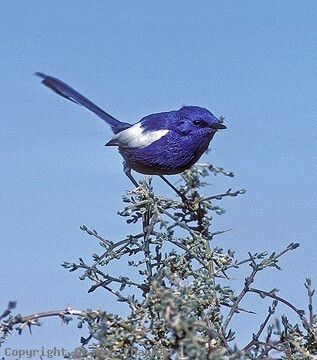 White-winged Fairy-wrens are birds of the arid and semi-arid shrublands of the inland ranging from just west of the Great Divide in the east all the way to the west coast of W.A. (and two offshore islands). They inhabit a range of open habitats (usually devoid of trees) including saltbush, spinifex, lignum and samphire. There are only two capital cities where you can see them, Perth where they occur at a few spots in the coastal suburbs and in coastal samphire, just north of Adelaide. There are only three subspecies. 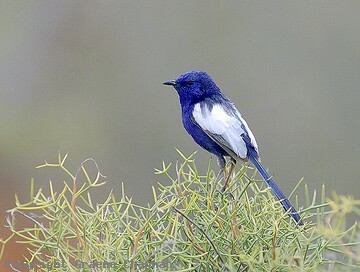 The blue and white form occupies the Australian mainland and there are two that are black and white, one on Dirk Hartog Island (see under Black and White Fairy-wren) and the other on Barrow Island, both in W.A. The social life of White-winged Fairy-wrens is quite well known. 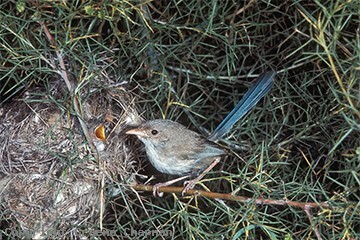 Whilst they do occur as simple pairs or in family groups like most other fairy-wrens in some areas, larger associations known as 'clans' are known in which, as well as the main adult pair, there are extra breeding pairs made up of subordinate males and females. The principal male is the only male in full breeding plumage which takes four years to attain and he is the boss! The extra males are all in various stages of immaturity; one year old males still have a pink bill like females, but with increasing maturity, they gradually acquire a black bill (see pic # 535210D) and eventually a few coloured feathers, the white ones usually first. They are effectively sedentary and breed in the same territory year after year and only wander into nearby territories (sometimes joining with the neighbours) in the non-breeding season. They are largely insectivorous but some small fruits (mainly saltbush) and seeds are eaten. In desert areas, they frequently breed after rain. The social structure of White-winged Fairy-wrens is quite complicated and very well detailed on pages 352-355 of Volume 5 of HANZAB. 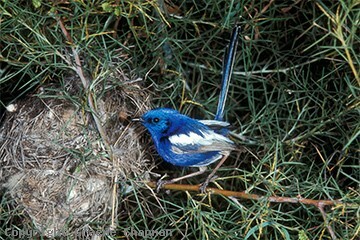 535201 ... White-winged Fairy-wren, male. 535202 ... White-winged Fairy-wren, female.